Standing Proud, BALIF's 34th Annual Gala is next week on February 28, 2014. If you haven't done so yet, now is the time to sponsor BALIF and purchase your tickets to the Gala ASAP. This year's format is an elegant cocktail party with food stations and drinks sprinkled around the venue. It's a fabulous format for mingling with old friends and meeting new ones. Don't miss the best party of the year! Your sponsorship of BALIF and ticket purchases will fund law student scholarships, mentor programs, CLE, Amicus briefs on LGBT issues, LGBT recruiting, social events to LGBT lawyers, community outreach, and much more. If your business or firm would still like to sponsor the Gala, it is not too late to take advantage of some of the many benefits of sponsorship, such as recognition through the end of 2014 on the BALIF website and newsletter, and complimentary tickets to the gala. The Gala is BALIF's largest annual event with more than 600 attendees, including lawyers, judges, lawmakers, legal professionals, students, and in-house counsel. This year we are thrilled to be honoring Judge Vaughn Walker with the Legal Service Award and LYRIC, A San Francisco LGBTQQ Youth Organization with the Community Service Award. Please join us to celebrate the amazing progress our community has made over the past year. Want to get the party started early? BALIF members and Gala attendees will be meeting at two different pre-party Gala locations: Blanc et Rouge and Bar 333. Starting at 5:30 pm on the night of the Gala, please stop by for a pre-Gala cocktail, meet new friends, reconnect with old ones, and prepare yourself for the Gala! Please visit the BALIF website at balif.org/sponsorship for sponsorship information or to purchase individual tickets. For more information email . We invite your Firm/Company to sponsor BALIF, the oldest and largest LGBT Bar Association for 2014. Your sponsorship of BALIF will fund law student scholarships and mentor programs, CLE, Amicus briefs on LGBT issues, LGBT recruiting, social events for LGBT lawyers and more. In exchange for your sponsorship, you will receive the benefits listed below, including complimentary tickets to BALIF’s 34th Annual Dinner and Awards Gala—Standing Proud on Friday, February 28, 2014, at the Bently Reserve. The Gala is BALIF’s largest annual event with more than 600 attendees, including lawyers, judges, lawmakers, legal professionals, students, and in-house counsel. This year we are thrilled to be honoring Judge Vaughn Walker with the Legal Service Award and LYRIC, A San Francisco LGBTQQ Youth Organization with the Community Service Award. Banner recognition as a Senior Partner-level sponsor through the end of calendar year 2014 on BALIF website and in BALIF newsletter, and recognition at all BALIF sponsored functions, including firm logo displayed at Gala event, BALIF MCLE events, monthly networking receptions and law student functions. Admission for twenty people to 34th Annual Dinner and Awards Gala. Priority recognition as a Partner-level sponsor through the end of calendar year 2014 on BALIF website, in BALIF newsletter, and at all BALIF sponsored functions, including firm logo displayed at Gala event, BALIF MCLE events, monthly networking receptions and law student functions. Admission for ten people to 34th Annual Dinner and Awards Gala. Priority recognition as Advocate-level sponsor through end of calendar year 2014 on BALIF website, in BALIF newsletter, and in all printed and online 2014 Gala materials. Priority recognition as Benefactor-level sponsor through end of calendar year 2014 on BALIF website, in BALIF newsletter, and in all printed and online 2014 Gala materials. Admission for five people to 34th Annual Dinner and Awards Gala. Priority recognition as Individual sponsor through end of calendar year 2014 on BALIF website, in BALIF newsletter, and in all printed and online 2014 Gala materials. Admission for one person to 34th Annual Dinner and Awards Gala. 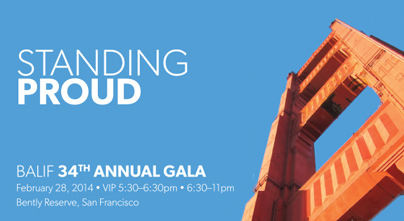 In addition, BALIF sponsors may also participate in a limited number of additional sponsorship opportunities at the 2014 Gala event, including naming and branding recognition at various food, drink and entertainment stations throughout the event at the Bently Reserve and sponsoring the official Gala After-Party, likely in the Castro District of San Francisco. Prices for these additional sponsorship opportunities will range from $500 to $5,000+. If you are interested in any of these opportunities, please contact me at the email address or phone number below. Please note, these additional sponsorship opportunities are limited in number so please contact me soon if interested. You must respond, and your payment must be received by February 7, 2014 for your sponsorship and advertisement to appear in the Gala program. We hope that you will join us in Standing Proud as a BALIF sponsor and look forward to seeing you at the 2014 Gala!